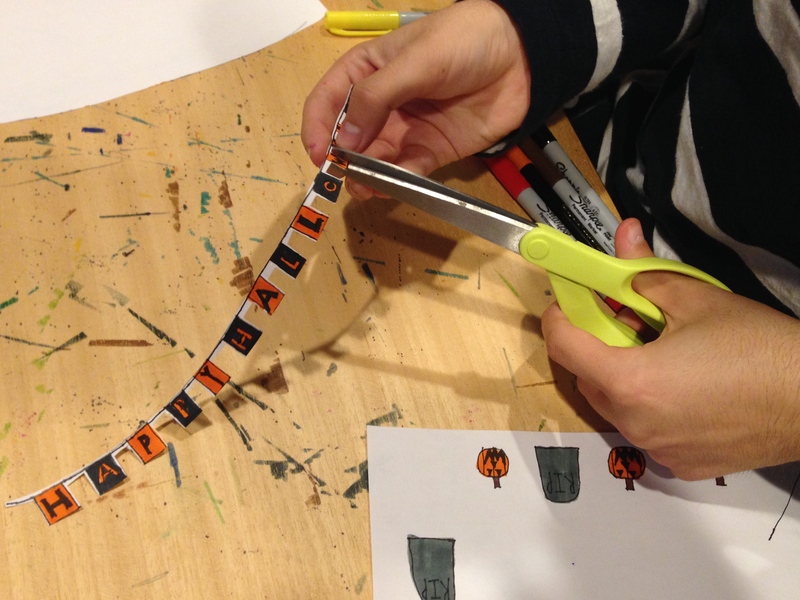 He’s on a roll with drawings and decorating, and today the trains need Halloween prep. I never fail to marvel at the focus and precision he brings to these projects, which are totally his idea. 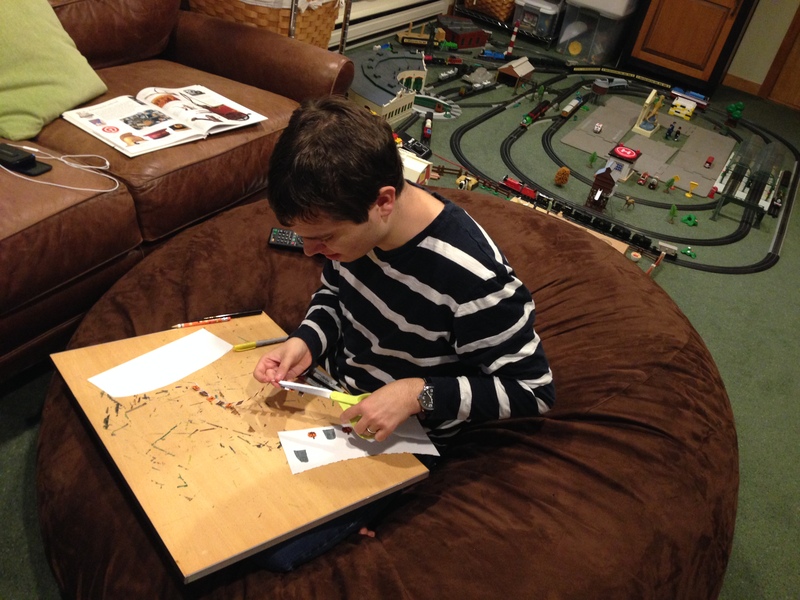 Add to that he has positioned himself right in the middle of our own project of reorganizing part of the basement – we are working near and around him, going back and forth, calling to each other and generally making a racket. He is unperturbed. Add to this list of potential antecedents my request that he move part of his train set temporarily so that I can clean out and move a cabinet that holds various frames, craft supplies, toys and videos. I don’t really want him to see the things I intend to give away, but have already decided that I won’t give away anything he wants me to keep. We have finally learned to pick our battles. I can tell he doesn’t want to move the train tracks out of my way, and I am prepared for him to declare that I am an Onion lady who is too full of organizing. I wait a while to let the request sink in and focus on something else. Then he materializes in front of me, holding a box of videos: “I’m too old for these.” They are Richard Scarry ABC and counting videos. They are my favorites. But I take them and set them aside with the other “give away” things. Then he appears with another box of videos, classic Disney this time. “We have all of these on DVD, which is more efficient.” Then I realize that, rather than move the tracks or allow me to navigate around them (which I couldn’t – I’m such a klutz I would definitely step on them) he is carefully removing everything from the cabinet himself. 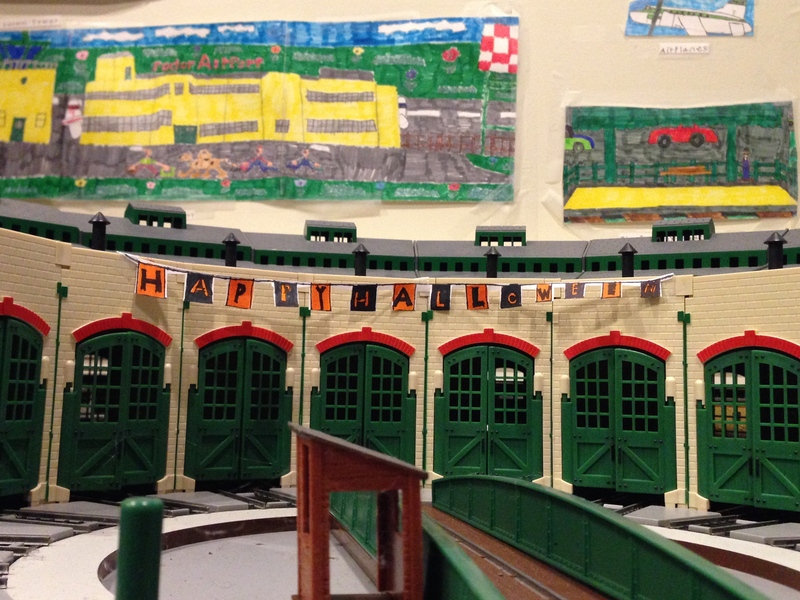 So while he was constructing Halloween decorations for his trains, he was also making decisions about growing up, and managing change and doing it all beautifully, meticulously, and offering up explanations along the way. A task that would have been frought with emotion and behavior management (and that in younger years I would probably have attempted in the middle of the night or while he was somewhere else) had evolved so peacefully I almost didn’t notice – until I realized that he was having an easier time parting with things than I was (you don’t want that 12-foot train puzzle that you put together a thousand times, really?). Not so long ago I wondered if he would ever grow out of some things and I concluded at the time that it didn’t hurt to wait. It’s not always true that all things come to those who wait, but on this day it is. As I was reminded by him more than once this week, “Patience is a virtue, Mom.” True, that.